On August 29th the Museum will feature a new and educational exhibit depicting the rich tradition of salt water fishing along our Jersey Shore. A pictorial history will be featured of ‘big catches’ made over the years as well as the actual fishing gear used to include an extensive display of antique rods and reels. 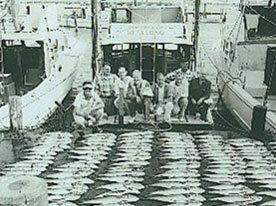 Photos of the many fisherman with their catches will be illustrated as well as their work boats used back in the day. Additionally we will display a complete listing of ‘record catches’ within the many categories of fish that live in our waters. All exhibits will be supported by in depth narratives with detailed information on specific topics. The Jersey Shore Fishing Exhibit will surely be of interest to all, and don’t forget to bring the kids!